A king bed room on the second floor with a gas fireplace, sitting area, TV, two-person Jacuzzi bath and a shower for two. Two night, full immersion weekend including; *hand written roles pre-sent to you. *Wine welcome reception, meet your weekend 'guests' *Two night luxury accommodations, all rooms flat priced! * Dinner on Saturday, the event happens! * 5, $100 gift prizes at the end.. * Themed weekend, costume as much as you like and live the 'character'! * Amazing cooked to order breakfasts included daily! This second floor king bed room also has mountain views from the bedroom, a gas fireplace, TV a two-person Jacuzzi bath, and a shower for two. Second floor room with forest views, queen bed, gas fireplace, TV, two person Jacuzzi bath and separate shower. This original structure allows for privacy and quaint feel! 100 years young this cottage has a french outside feel and if you prefer elegance and a modern design you should book at the Inn direct. This one-level tiny home, with a screened-in front porch just behind the Main Inn features a queen bed, living room with a gas fireplace, TV, forest views and a wet bar with small fridge. The two person Jacuzzi bath has forest views and separate shower. Rustic Country French design and privacy are features! 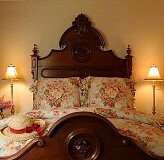 Contact Nancy our Innkeeper for our Main Inn's four diamond accommodations. Our Chef's scrumptious Menu Gourmet breakfast included daily! Specials, Vegan or Vegetarian are our pleasure, let us know! 100 years young in design, this is a cute outside cabin feel. If you wish for privacy and rustic accommodations, then this is the place for you! If you wish to reserve one of our 20 fabulous rooms in our inn, give Nancy a call! This cozy tiny home offers a wood-carved queen bed. Harken back to simpler days however it has a flat screen TV and wonderful forest views. There is a two-person Jacuzzi bath with forest views, a shower and a private back deck. This rustic tiny home is the perfect serene bear viewing location for lovers! If you wish for the four diamond experience, contact Nancy and book a room in our Main Inn where you will find luxury accommodations and impeccable service. French Country, 100 year old structure brings you back to the rustic feels of Jackson! This Rustic two story Cottage embraces quiet; hence no wifi will be available at this unit. If you prefer a modern hotel, this unit is not for you, book accommodations in the Inn for the latest in design. This two-level tiny home is closest to direct parking and offers a living room and full bath on the first floor. The Shower is a stand up shower. The Jacuzzi bath has shutters that open to view the gas fireplace and TV. In the cooler months we do offer portable heaters as the unit footprint is large enough that the heat supply would not reach the tub. The narrow staircased second floor has a king bed, half bathroom and skylight. Privacy is optimal with this tiny home - return to the earlier days of Jackson in this rustic and country feeling cottage.